There is considerable discussion in international education around improving data collection and analysis. And we have often noted that better data has applications for everything from making more effective admissions decisions to boosting student recruitment and retention. Strictly from an international educator’s point of view, if you have a clearer idea of the results of your marketing efforts you can make better decisions and target your recruitment budget to the markets or tactics that yield the best returns. Many institutions, notably in the US but in other major destinations as well, are facing an increased call from senior leadership for stronger return on investment (ROI) data that can help drive evidence-based decision making and planning in international recruitment. This more ROI-oriented perspective is an approach that shapes not only international recruitment strategy but also may be an important aspect of making the business case for an ongoing or expanded commitment of resources for international recruitment. Indeed, some practitioners perceive a shift from a context where there was limited use of such ROI metrics toward a “culture of evidence” where strategies and budgets are underpinned by hard numbers. Mr Kacenga and his colleagues – Cheryl DarrupBoychuck, director of institutional relations at INTCAS and Angeliki Rigos, associate professor in the Department of Chemistry and Biochemistry at Merrimack College – have created a detailed and flexible model for measuring ROI. Return on Investment for International Educators (ROIIE) is freely available online, and the project team has continued to expand the service with new features over the course of 2016, including new functions that allow users to save their work from the site and revisit it whenever they like. “We hope the model sparks broader conversations about campus-wide strategy, so a team of colleagues can define parameters that are measured consistently over time,” says Ms DarrupBoychuck, who also cautions that ROIIE is not meant to be used for benchmarking institutional ROI against other colleges or schools. Rather, it is a tool that individual institutions can use to model their returns on international recruitment budgets and to monitor performance on an ongoing basis. 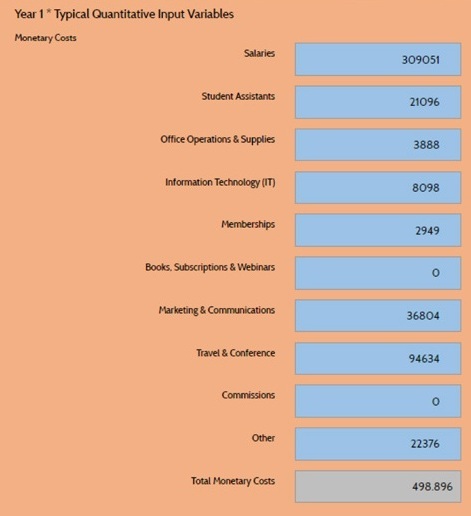 The ROIIE model aims to account for both relatively straightforward inputs, such as staff salaries, travel costs, or other direct marketing spending along with staff time invested in marketing and recruitment. The model relates these investments to an equally straightforward set of “outputs,” including how many students were recruited and how much tuition revenue was generated. But part of what makes ROIIE interesting is that it then goes beyond this baseline of inputs and outputs to factor in the influence of a set of “quantifiably elusive variables,” or QEVs. As the term suggests, these are trickier elements to nail down, but they are nevertheless important factors that act on international recruitment results. They include, for example, the support of senior leadership for international education (or even for a specific strategy or market in the case of more targeted ROI calculations). QEVs may also include the relevance of international to the institution’s academic mission, or the prestige associated with internationalisation initiatives. 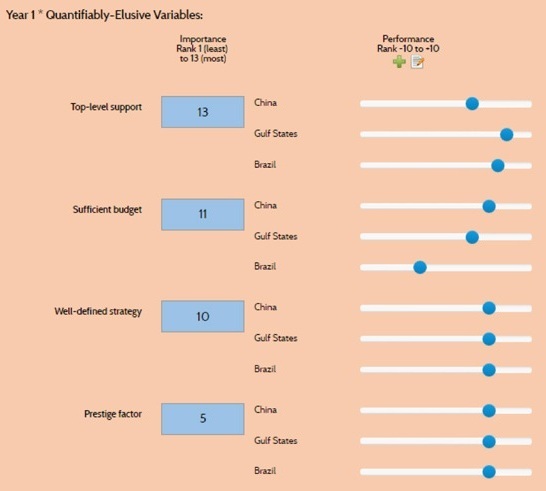 The model asks you to rank 13 or more QEVs, where 1 is “least important” and 13 “most important,” and anticipates that different institutions may give a different priority or weight to these variables. 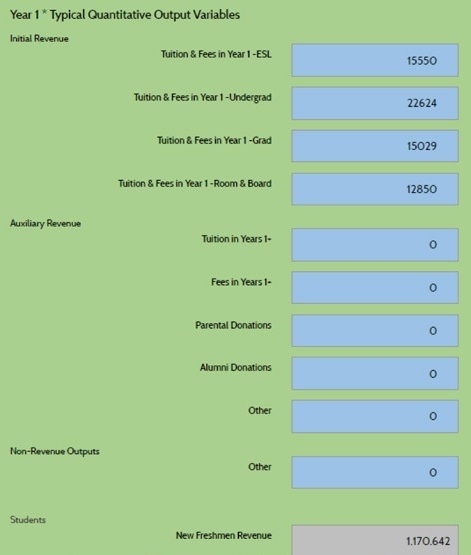 In addition to a simple weighting of QEVs, ROIIE also asks you to assign a performance value to each, which is another admittedly subjective factor that may vary from campus to campus. These performance values range from -10 (indicating poor performance or weak market conditions related to the QEV in question) to +10, which denotes strong performance or market conditions for that variable. These weights may be assigned across the international recruitment effort generally, but the model also allows for a more nuanced analysis where variable performance ratings can also be assigned on a per-market basis, as in the example below. ROIIE factors in both quantifiable and QEV factors to provide three types of ROI calculations: qualitative modelled ROI (which compares results against QEVs for the overall recruitment effort or across different markets), a financial ROI (simply: the return for each dollar spent), and market time ROI (the number of students recruited per 100 hours of staff time). Each of these measures allows an institution to track its ROI performance more comprehensively and consistently over time, especially as multiple years of data are used to expand the analysis, and also to make observations about which sending markets are the most efficient in terms of results generated against effort and budget expended. As this point illustrates, there is no question that there are some significant challenges to be solved as the industry works its way to more and more robust ROI models. Nevertheless, the work the ROIIE team has done this year opens the door to more experimentation and development in this area. It also provides some valuable new tools and perspectives for educators who want to expand their own work in support of a greater emphasis on evidence-based decision making within their respective institutions. This entry was posted in Higher Education and tagged education abroad, International student recruitment, universities with international students, undergraduate student recruitment, international students.